Pretty soon, from a city not so far, far away – Gdańsk – a truck that inspires respect on the Nordic routes will arrive at Pyrkon. It’s name is VADER. The cruiser on wheels would often come across X-wings, the Death Star, Han Solo or even the Emperor in its path. It was pursued by both bounty hunters and rebels, with Luke Skywalker as their leader. Thus! 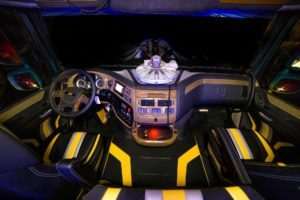 Prepare yourselves to meet the transport legend, to travel through distant galaxies together. Become part of this story! Do not dare to underestimate the power of the dark side that oozes from it. Every day, the Tom-Tech truck travels through the cold and demanding trails of Sweden, Finland and Norway, carrying loads weighing several dozen tons. 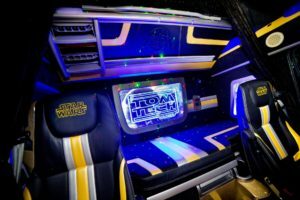 It is entirely inspired by the Star Wars universe, and each detail both inside and outside the truck, was made with incredible care. None of our northern neighbors remain indifferent to its dark secrets. Can you defy them? May the Force be with you! Come to Poznań to face the power of the Empire!